THE HAGUE, July 23. /TASS/. Some large pieces of wreckage still remain at the crash site of Malaysia Airlines Flight MH17 in eastern Ukraine, Eric van de Beek, a journalist with the Novini media outlet told TASS on Monday. A new article dedicated to the MH17 crash, published at the media outlet’s website, contains a number of photos and a video showing pieces of wreckage, which apparently include the aircraft’s tail-plane, pieces of aircraft covering, pieces of a wing and an oxygen generator. "They are so big that they even can be seen using Google Earth," van de Beek said. "Very much to our surprise no Dutch paper or program has reported this news. I knew that what we are doing is Samizdat, but that the big media in The Netherlands leave this major discovery unreported is beyond me," he added. 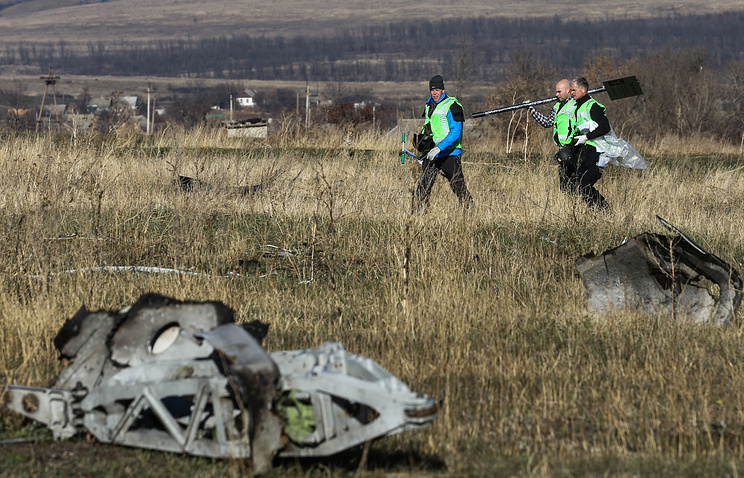 "If it’s of no interest to the Dutch media and authorities, maybe the Donbass authorities can hand the parts of the wreckage over to the Russian authorities, for them to research what happened to MH17," the journalist noted. "The question is how important these pieces of wreckage are," the article’s author Stefan Beck said. "A single bolt helped determine the cause of the Bijlmer crash [which occurred in Amsterdam in 1992 - TASS]. Dutch prosecutors say that the cause of the MH17 crash has been determined but skepticism still remains as no one is studying the wreckage that has been there for a long time," he pointed out. The Malaysia Airlines Flight MH17, a Boeing-777 passenger plane travelling from Amsterdam to Kuala Lumpur, was shot down on July 17, 2014, over Ukraine’s eastern region of Donetsk. The crash killed all the 283 passengers and 15 crewmembers. There were nationals of ten states among the dead. The Joint Investigation Team (JIT) looking into the crash comprises representatives of the Netherlands, Australia, Belgium, Malaysia and Ukraine. On May 24, the Team gave an update of the state of affairs in the criminal investigation, claiming that "the BUK-TELAR that was used to down MH17, originates from the 53rd Anti-Aircraft Missile brigade... a unit of the Russian army from Kursk in the Russian Federation." Russia’s Defense Ministry rejected all the allegations and said that none of the missile systems belonging to the Russian Armed Forces had ever been taken abroad. The ministry noted that Moscow had provided Dutch investigators with overwhelming evidence proving that a Ukrainian Buk missile system had been used to bring down the aircraft.